Magnitude 4 earthquakes are common in New Zealand and we’ve had several over the past 24 hours. A magnitude 4.7 at Hawera from 120km down. 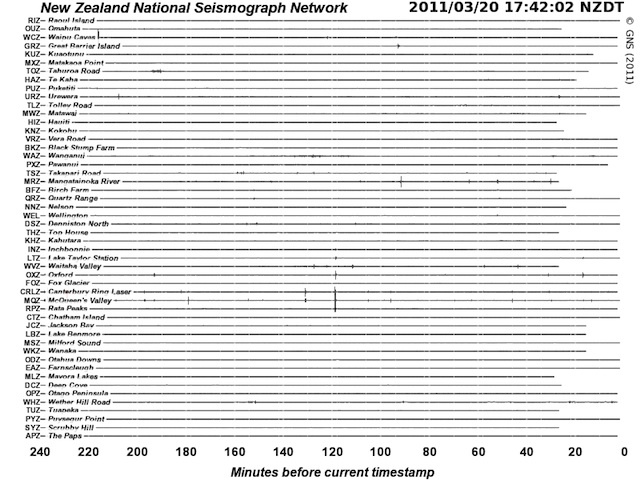 Three magnitude 4+ earthquakes in 25 minutes near Twizel, and (much) smaller aftershocks in the Christchurch region. None of these are ‘for the record books’ as Ken Ring said to Marcus Lush. This fuss has seen more traffic to my blog than ever. A good thing, right? Actually, it’s partly why I’m sick of the Ken Ring fiasco. Readers can’t see the blog traffic, but I can. A good 60-80%+ of the traffic each day over the past ten days or so has been to a short article on why it never mattered what happened today. It’s depressing to see the bulk of my readership go to a topic like that for days on end. You can only hope it’s mostly people who think Ring’s ’predictions’ are silly, but that it’s attracted the sort of attention is has at all is a bit disquieting. It’s also not as if I’ll stop letting people know what I think of homeopathy and whatnot; it’s the sheer persistence of the thing that is a bit much. I want people to be reading about all the great things happening in science, not hare-brained ’predictions’ and the media circus feeding off it. On that note, I offer below some of my longer-form articles for general readers, with teasers. Older articles including videos, shorter pieces and a few more serious articles can be found in my blog anniversary day listing or just browsing around the archives to the right of this page. Feel free to comment, even if the articles are old. Don’t forget my colleagues blogs too. Monkey business, or is my uncle also my Dad? I’m still get a couple of visits a day to this early post. For male pygmy marmosets, their genetic father could be their uncle. Confused? Check it out. GMOs and the plants we eat: neither are ‘natural’ An attempt to point out that, among other things, both our ’natural’ foods and GMOs are both not ‘natural’ really. Preserving endangered species — of gut microbes A interesting idea – new to me –that we should not only conserve rare species of animals but also microbes in our gut that reflect now rare diets. Popularity does not mean effectiveness or sensibility This very short post shows up a common fallacy in a fun way. Autism – looking for parent-of-origin effects Some genes are expressed in a way that depends on what parent the gene was from. I report on a study looking at autism this way. Forgetting older science In which I worry that PubMed and it’s ilk are causing a (temporary) lost of older science. Advice for students heading to university Inviting suggestions, starting with a few of my own. You can change the ideas, but not the data I overheard Professor Lawrence saying this to religious students that crowded around him after his public lecture. It resonates with me and not just in science: advocates of pseudo-science (e.g. those pushing unsubstantiated ’remedies’) often try replace data with ideas of their own.